Fleece Robes - Ahhhh, nothing feels cozier than slipping into a fleece robe and wrapping yourself in its softness at the end of a long day. 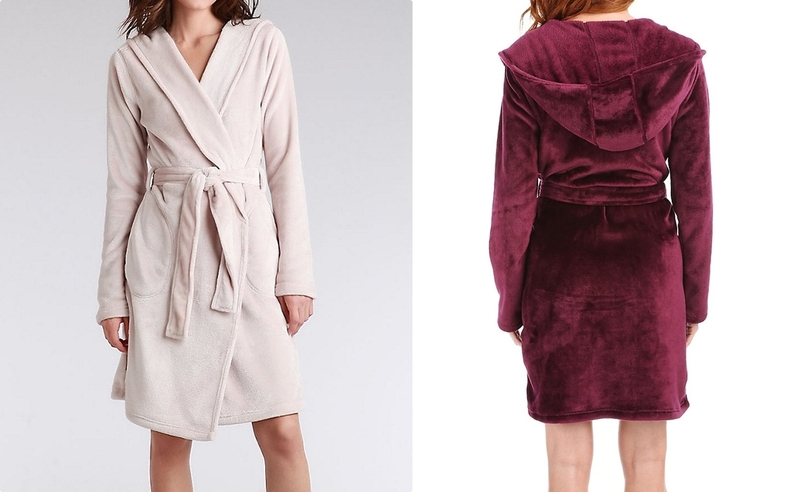 Designed for maximum plush, it's easy to take your enjoyment to the next level when you choose a snuggly bath robe from one of the best brands in the world. When it comes to luxurious fleece robes that are irresistible, these labels are at the top of their game. Follow along as we reveal our top picks and what makes each of them so special. Yes, it's one and the same UGG. And, if you love their famous boots, you're going to love their womens robes. This California based company has moved beyond the cozy world of sheepskin boots, and is now producing amazing sleepwear and loungewear - pajamas, sleepshirts, bathrobes, socks, and of course slippers. Designed for comfort and warmth with a casual feel, UGG loungewear is the perfect choice for keeping warm during the cold winter months. Made from an ultra plush fleece that's not too thick yet super luxurious, their ladies robes offer an easy and relaxed fit in a variety of earthy colors that will go with just about everything. Thoughtful details like a comfortable shawl collar and side pockets make these robes hard to resist. Fleece is a hydrophobic fabric. Rather than absorbing water, it actually repels it. Even if it does become wet, fleece does not lose its warming powers. When it comes to quality luxury robes that are classic in design, Natori has just the right formula. An expert in lounge wear, Josie Natori understands that women want the best sleepwear styles and materials for comfort and warmth. Natori has mastered the art of clean and simply designed robes that fit the busy lifestyle of today's modern woman on the go, while looking great, year after year. Choose from classic shawl collared warm microfleece or their newest "cashmere" fleece robes with large roomy pockets and long sleeves that can be rolled back for comfort. Available in soft shades like bone, soft mink, and heather grey, these beautiful robes will complement any sleepwear palette. Miss Elaine Sleepwear - Cozy, Comfortable, and Craveworthy! This classic, all-American brand might not be the first intimate apparel label that comes to mind when you’re shopping for warm and cushy sleepwear, but their plush fleece robes and fun bed jackets might just be their best kept secret. We adore the wide range of sizes that Miss Elaine offers - all the way from petites to plus sizes, and the gorgeous array of pretty color options, from crystal pink to robin’s egg blue. Their classic and generous styles flatter virtually every silhouette - women love wearing these robes, knowing that they look and feel their very best. This timeless brand stands behind every one of their products, offering the finest quality at a price point that is quite affordable. Polyester fleece is naturally resistant to many stains, and can be machine-washed and dried in a clothes dryer. These bath robes will dry quickly, even if hung from a rack or a line rather than dried in a machine. If using a clothes drier, dry your intimate apparel and lingerie robes on the low setting to prevent damage to the fabric. Use cool or warm water when washing fleece and any lingerie fabric. Heralded as one of the first "Oprah's Favorite Things," Karen Neuburger is a beloved sleepwear brand that women everywhere have come to love. Designed with beautiful quality fabrics in pretty and comfortable styles that can be worn year round, this label takes their sleepwear from ordinary to amazing with exciting trims and detailing. We love the Karen Neuburger fleece bed jacket, with an easy fitting shawl collar, long sleeves and three button front - in warm, soft, and heavy fleece, it's perfect for lounging, reading and watching tv in bed on a cold winter's night.